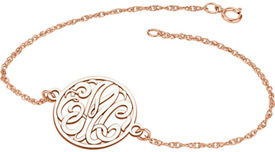 Personalize your monogram jewelry with your family's initials in gold or sterling silver. Because of its uniqueness, monogram jewelry remains a popular choice for millions of people today. While there are beautiful pieces to include rings, bracelets, and necklaces made in more traditional styles, we also see an incredible selection of contemporary pieces. To better appreciate owning initialized jewelry, we felt it important to provide a brief history. While there are some differences in opinion regarding the origin of monogram jewelry, we know it was first designed hundreds and hundreds of years ago. Now, according to many reputable historians, the monogram itself was first introduced during ancient Roman and Greek eras. At these times, coins were stamped to help identify not only the kingdom�s ruler but also the specific region being ruled. Read more. Then during the Middle Ages, it became common practice for artisans to sign creations such as crafts, artwork, statues, and so on. However, keeping with a creator�s mind, a full signature eventually changed to a simple monogram. Over time, European lords followed in the steps of ancient Roman and Greek rulers by using monograms to symbolize a particular kingdom but this time on a much broader assortment of items to include official documents, police badges, and even flags. By the Victorian era, the importance of monograms increased to the point that people began to have silverware and lockets marked, among other things. While monograms have always been associated with status, monogram jewelry during this period was definitely for the rich and famous. It became a known fact that someone who wore monogram jewelry lived a high society lifestyle. Specific to monogram jewelry, items were first designed so the person�s first initial was placed on the left, followed by the middle initial being to the right, and the last initial in the center. In addition, it was common for the initials on either side to be smaller in size while the center initial was more prominent. Today, you will still find monogram jewelry made to follow the original style that dates back to the Victorian era but there are other designs as well. 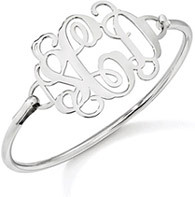 Of course, there are other changes associated with monogram jewelry. For example, rather than wear earrings, a ring, bracelet, or pendant with a person�s own initials, jewelry designed with someone else�s initials is worn. 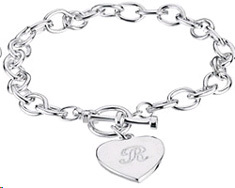 For instance, a mother might choose a necklace or earrings designed using her child�s initials. You will also find a much greater selection of fonts. While the more traditional monogram jewelry uses an italicized type font, you can choose from virtually any font which in turn creates an entirely different look.